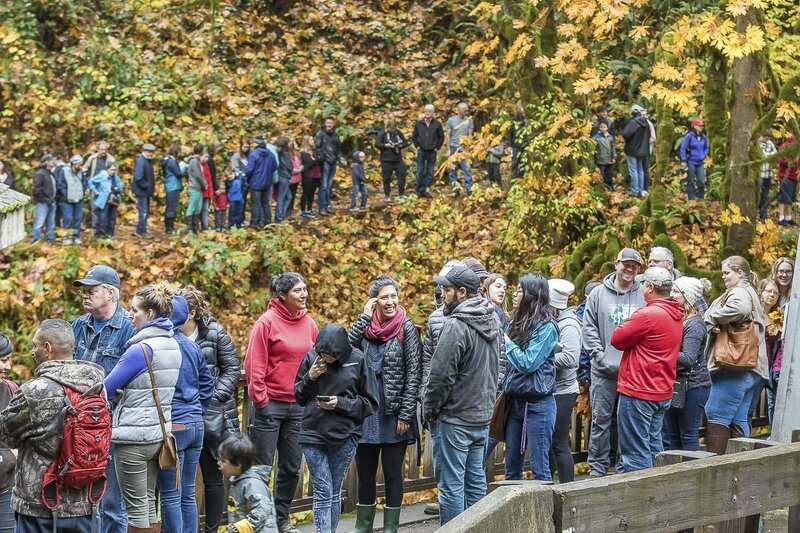 WOODLAND — For the past three decades, Clark County families have lined up on the last Saturday of October along the path that leads to the old Grist Mill along Cedar Creek. They did so again this past weekend, despite the threat of rain, to take part in the popular annual tradition. 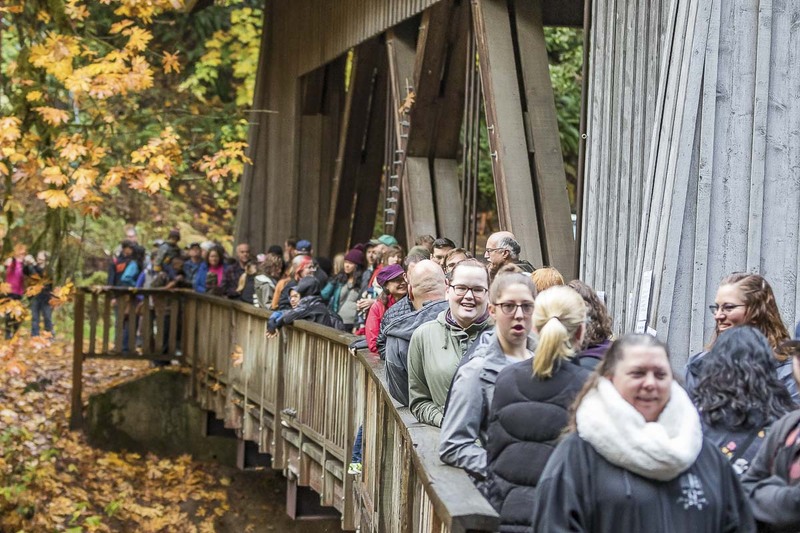 Starting at 9am, families lined up all the way past the covered bridge that leads to the popular scenic destination for a shot at helping over a dozen volunteers press cider. 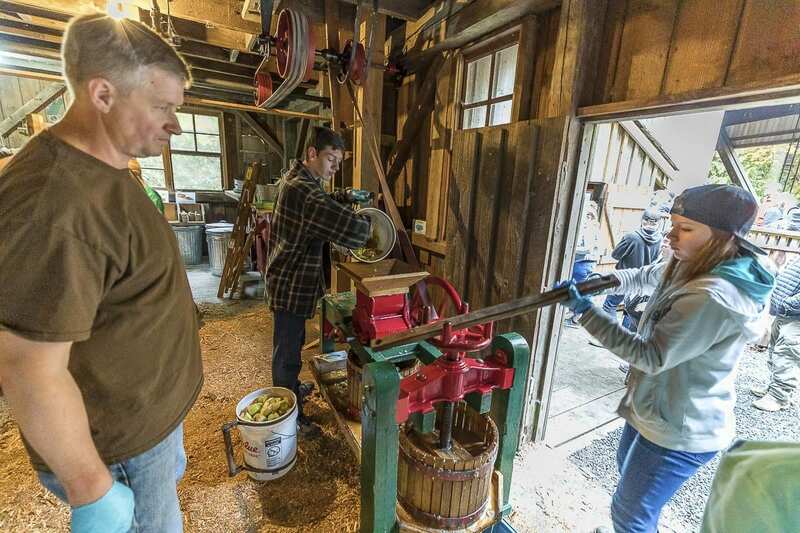 Younger visitors get to watch nearly four tons of apples get washed, scrubbed, chopped up, and then through an old fashioned grinding machine powered by belts and pulleys moved by the powered by Cedar Creek below. At the end of it all, they get to go home with a bottle of the freshest cider you can find around these parts. 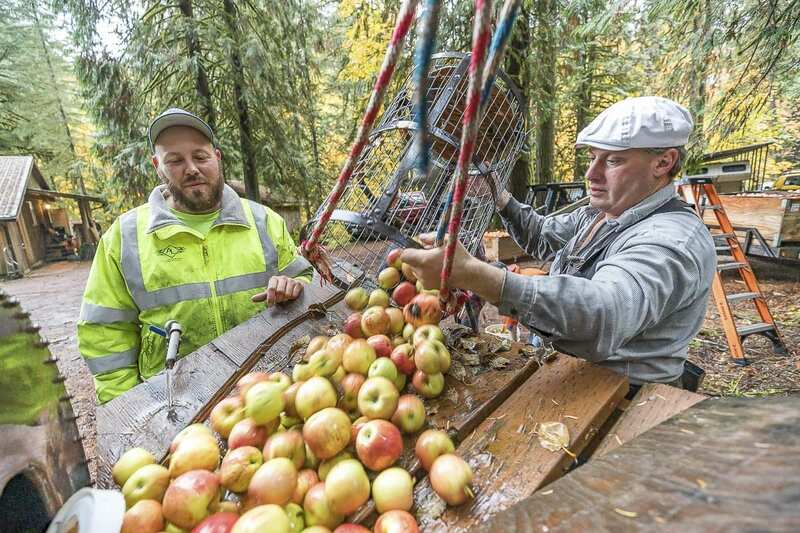 Visitors get to assist in the final step of the process, operating a press by turning an old hand screw to extract the juice from the apples. That juice is then filtered before being bottled. The Cedar Creek Grist Mill has been around for well over a century now, opening as the Red Bird Mill in 1876, 13 years before there was even a Washington State. It was originally used to mill wheat grown in fields all over northern Clark County, usually used for animal feed. In 1961 the Fort Vancouver Historical Society leased the mill, helping to get it on the national register of historic places. They also helped to replace the rotting foundation of the aging structure. 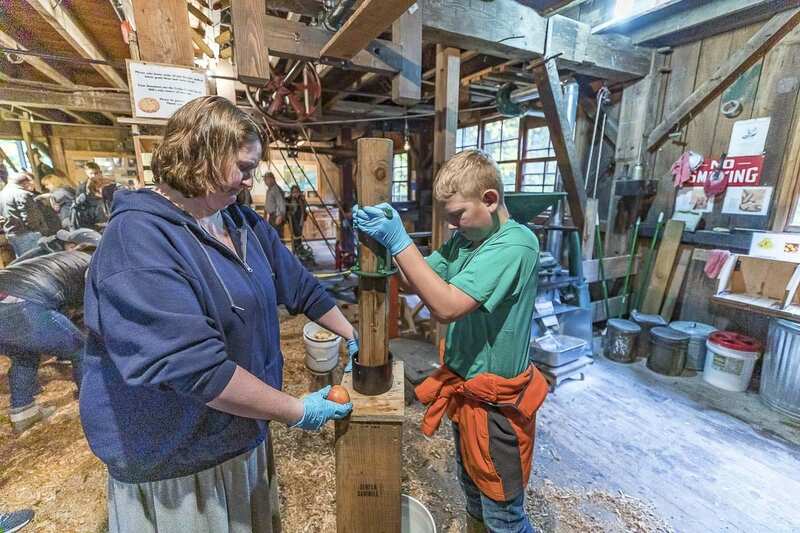 The mill is now operated as a working museum by the Friends of the Cedar Creek Grist Mill. They helped to build a new covered bridge in the early 90’s to replace the old one that was falling apart. 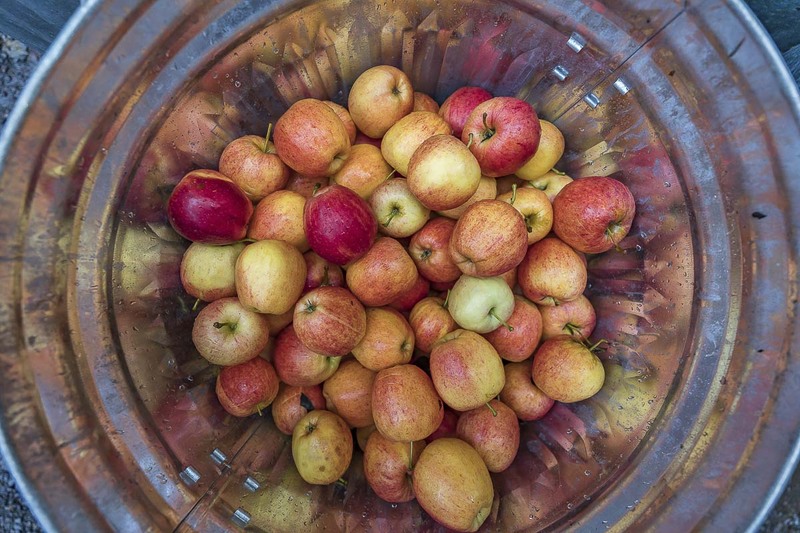 The Apple Cider Pressing is just one of a number of activities held at the mill throughout the year, including Bread and Butter Day, Blueberry Pancake Day, and Treat Day. It also remains a popular spot for photographers and painters alike. The mill is staffed by around 10 volunteers during the year, with a few more on event days. If you’re interested in volunteering, you can visit the mill’s website. The Cedar Creek Grist Mill is located at 43907 NE Grist Mill Road, Woodland. Contact volunteers at the Mill at (360) 225-5832.